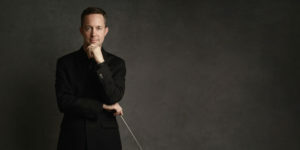 The 2018-19 season marks Maestro Clay Couturiaux’s seventh season as Music Director and Conductor of the Richardson Symphony Orchestra, his fifteenth season as Music Director and Conductor of the Monroe Symphony Orchestra in Louisiana, and his seventeenth year as Assistant Director of Orchestral Studies at the University of North Texas. Maestro Couturiaux has accumulated over two decades of experience conducting professional symphony orchestras and teaching at the university level. His career has taken him across the United States, Europe, and Asia including concerts with the Milano Classica Orchestra da Camera of Milan, Italy and in Taipei with the National Taiwan Normal University Symphony Orchestra. Other professional conducting engagements include performances with the Abilene Philharmonic, Arkansas Symphony, Austin Symphony, Ballet Arlington (now Metropolitan Classical Ballet), East Texas Symphony Orchestra, Texas Chamber Orchestra, and Wichita Falls Symphony Orchestra. As Assistant Director of Orchestral Studies at the University of North Texas, Dr. Couturiaux teaches fundamentals of conducting technique, advanced orchestral conducting, administrates the orchestral studies area, and is conductor of the UNT Concert Orchestra. Additional recent highlights include conducting the UNT Symphony Orchestra in concert for an audience of 37,000 at Cowboys Stadium in a major collaboration with the North Texas XLV Super Bowl Host Committee, NFL Films, and Tim McGraw. Couturiaux has also recorded with the UNT Chamber Orchestra on the Crystal Records label. In March 2013 the Northeast Louisiana Arts Council named Maestro Couturiaux the recipient of the Edmund Williamson Artist of the Year Award. The award is presented to an artist who the selection committee feels has made the most significant contribution to the improvement of the quality of life for Northeast Louisiana. Raised in Texas, Couturiaux began his musical studies at the age of eight in violoncello and piano. He holds degrees in both conducting and violoncello performance from the University of North Texas. In addition, he developed his conducting skills at the world-renowned Pierre Monteux School for Conductors and Orchestra Musicians in Maine and at the National Arts Centre Conductors Programme in Ottawa, Canada. The long list of distinguished conductors with whom Couturiaux studied includes Anshel Brusilow, Jorma Panula, Michael Jinbo, Hugh Wolff, Neal Gittleman, Carl Topilow, and Harold Farberman. Clay and his wife Desirée have been married since 1995 and have two wonderful daughters, Addie and Ava.